Hello everyone and welcome to the second edition of our newsletter for 2017. This week's newsletter focuses on our first dependent student residential program for the year which concludes today. 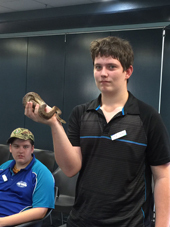 It has been a fabulous week, with students from across the NT in attendance. Many students have also attended our weekend Science workshops held at either side of the week as part of their formal assessment for these courses. A huge thank you to all staff for their organisation, participation and hard work. A big congratulations to all the students who attended for their exemplary behaviour, positive attitude to learning and genuine respect and response to the program that was undertaken. All students participated positively and they now all have a very solid launching pad for success with their studies in the year that lies ahead. This week we also held our School Council AGM and March General Council Meeting. I would like to officially welcome all of our new parent and teacher representatives to Council and thank them for taking up these positions. We are always keen to have parents represented on School Council and if you would like to be involved, please contact the school reception on 8922 2222 or ntsde.admin@ntschools.net. You can read more about who these members are further on in the newsletter. With only three weeks until the end of term one, the year is off to a great start and I look forward to introducing you to the 2017 Student Representative Council in the next edition of our newsletter that will be out in week 10. Congratulations and thank you to all members of the 2017 School Council. Your participation in this important part of our school community is greatly appreciated. Please note that student representatives will be announced after the Residential School Program. It is tremendous to have the support of parents, teachers and students on School Council this year. We still have a parent vacancy and would welcome any parent who would be interested in filling this vacancy, please contact the School Reception on 8922 2222. Monday 13th March saw us ready to welcome a record number of students for our first Residential of the 2017 school year, at least those who were able to get through the flood waters, that is. Our participants came from all the regions of the Territory including a record 5 students from Yulara in the centre, Alekarenge in the Barkly, stations in the Katherine region, Alyangula from the East Arnhem region, Jabiru in West Arnhem plus students from Dundee, Bali and Darwin itself. Along with our brand new year 10's we had many first time Residential attendees to our new school campus and all settled into classes and activities from lesson 1, with very few found wandering the corridors looking for the right rooms. 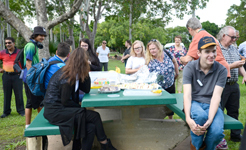 A number of mums and dads dropped in to join us for morning tea on Monday, which made the day an even better way to start Residential. In addition to the productive work taking place in lessons, teachers and students got to know each other very well, which will only assist in successful outcomes for all students. NTSDE students have had increased opportunities in using more of Darwin High School and other close local facilities along, with the daily use of the school's oval tables for morning teas, a real school canteen and the gym at lunch with the Darwin High students, in addition to our first Year 12 Principal's lunch at the Museum and Art Gallery Café. This year's afterschool activities have included a Monday sports program where badminton, table tennis and indoor soccer were on offer with a new activity this year being the Wednesday 'barefoot bowls' hosted by the Darwin Bowls club which is only a short downhill stroll from the school and the play "The Doll's House" on Thursday evening was enjoyed by all who attended. 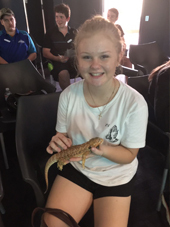 Additional class activities included excursions to Crocosaurus Cove for Year 10 Science, the Meteorology Bureau for Geography, trampolining in Physical Education, the East Point War Museum for History and the Menzies School of Health which gave a hands on experience in Health promotional activities. Another successful Residential was capped off by the Spirit of Learning Awards, awarded to Nisa Howie and Hunter Torr for displaying enthusiasm, preparedness and commitment to their studies during the Friday morning tea. Meanwhile, Sandra Jestin and Maverick Torr were awarded the 2017 Charles Darwin Achievement Awards. Looking forward to seeing everyone again during the Dependent Residential #2 and the Completers Residential in Term 3. If you have not seen NTSDE's new promotional video, click below to watch.